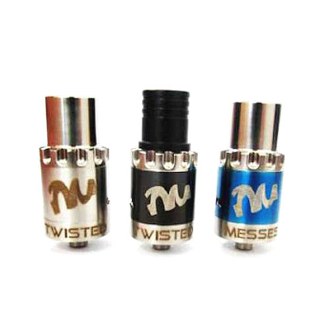 If you like to build your own creative coils, then the Twisted Messes RDA Atomizer is for you. This atomzer has three drip tip/chuff cap options and a removeable outer airflow ring. This RDA comes with two outer rings, one is gunmetal blue and the other is a polished stainless steel. Both outer rings have the Twisted Messes logo. The Twisted Messes RDA has a four post design with 2.8mm holes and a 6mm juice well. It has an adjustable silver plated and double insulated 510 threaded center pin in the middle of the double o-ring base. The mirror finish on the removable stainless steel ring sets this RDA apart from the rest. With its 4 post design, the more coils you add, the more clouds you get. So let's get your vape on!